This book is a behind the scenes memoir of NASA flight director, Gene Kranz. Kranz recounts thrilling historic events and reflects on what has happened to the current space program. 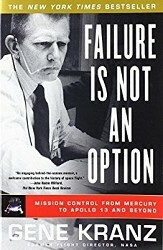 This book is a fascinating account of a veteran mission controller during one of America's most important times in history.